This is the time of year so many people post their resolutions for 2012 and reflect on how they did for 2011. This is the time of year I say “Screw Resolutions” and post the most fattening cupcakes I’ve ever had. They’re completely delicious, amazing, and rich so really I’m doing you a favor. If you insist on dieting for 2012, make these for your New Year’s Eve party as one last hurrah. 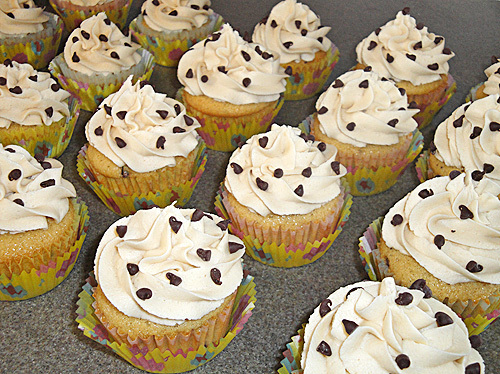 These Chocolate Chip Cookie Dough Cupcakes feature a chocolate chip cupcake base with an egg-free chunk of chocolate chip cookie dough inside each one. Then you top it off with a cookie dough flavored frosting and sprinkle on some mini chocolate chips for decoration. The 6+ sticks of butter might be intimidating but before you give up on cupcakes forever you’ll know you’ve had the best one there is. Recipe is from the brilliant Annie from Annie's Eats. It's just like eating real cookie dough but in cupcake form so give in to temptation and try one. Preheat the oven to 350° F. Line 2 cupcake pans with 24 cupcake liners. Cream together the butter and brown sugar until light and fluffy. Mix in the eggs one at a time until blended smooth. Alternate adding the dry ingredients and milk to the sugar mix until just mixed. Stir in the vanilla. Divide the batter evenly and bake for 18-20 minutes until a soft gold color. Let cool. Blend in the flour, sweetened condensed milk and vanilla until mixture is smooth. Cover with plastic wrap and refrigerate until the mixture has firmed up a bit, about an hour. Mix in the powdered sugar until smooth. Add in the flour and salt. Mix in the milk and vanilla extract until smooth and well blended. Let firm up for 5 minutes. Once cool, cut a cone-shaped portion out of the center of each cupcake. Take your chilled filling and roll 1/2 tablespoon into a tiny ball. Place each ball into a cupcake. Use any leftover filling to make sure cupcakes are nice and smooth on top, where the hole once was. Spread or pipe the frosting onto each cupcake. I used a Wilton 1M tip. Decorate the cupcakes however you like, I added more mini chocolate chips to mine.